Severe food and medical shortages caused by two years of devastating war are having a major impact on everyday life in Yemen. The BBC's Nawal al-Maghafi travelled across the country to see the effects first hand. Samira ran into the school - now a makeshift cholera treatment clinic - with the desperation of a mother who knew she had little time left to save her child. To get here she had travelled for kilometres on foot, the only means of transport she could afford. I watched as she dashed towards one of the treatment tables, gently laying Orjowan, her 18-month-old baby, across it, and pleading with the doctors to save her. Her eyes spoke not just of her despair, but of visible exhaustion. For Samira, survival these past two years has been a relentless, never-ending battle. Pale and weak, Orjowan looked about half the size of a child her age, with visibly protruding ribs. In order to get this far Samira and her family had to endure, and survive, three of the biggest calamities of this war: displacement, famine and cholera. Like almost three million other Yemenis, Samira and her family are internally displaced persons (IDPs). Their home was hit in an air strike by the Saudi-led multinational coalition that is supporting the government in its war with the rebel Houthi movement. Samira's children, along with nearly half a million others under five years old, were suffering from severe acute malnutrition. Samira was too, which meant she could not breastfeed Orjowan. Instead, all she was able to give her daughter were meagre servings of powdered milk, prepared with water contaminated with the bacteria that causes cholera. As she watched over her child, Samira broke down in tears. "If there was anything more I could do for her, I would," she said. "Even if I were to ask my brother for help, he can't because he too is desperate." As she spoke, Orjowan lay on the table, so thin she was barely able to cry. Samira continued to watch her child's frail, pained body, looking utterly helpless. Sadly, Samira's case was far from being an isolated story - indeed, it was the first of many I would encounter on my journey across Yemen. Everywhere I went, I saw more people suffering from desperation, grief and defencelessness. In the rebel-controlled north of the country, we visited clinic after clinic, all packed with patients infected with cholera. At one site I met a family of 18, all suffering from the disease. It may sound perverse to say so, but these were - in many ways - the lucky ones; the people who were able to undertake and afford the journey to get treatment. More than 2,000 people are believed to have already died as a result of the cholera outbreak - the largest in the world - and 540,000 others have been infected. Because of the war more than half of all health facilities have closed or are only partially functioning, leaving 15 million people without access to healthcare. As we ventured further out into the countryside, we reached a village an hour-and-a-half from the nearest medical facility. There we found people in their homes or communal areas, lying on the ground or on beds, all suffering from cholera-like symptoms. I spoke to Abdullah and his sister, Hind, asking them why they had not gone to a hospital. He could barely summon the energy to reply. "We don't have the money for the transport," he explained, matter-of-factly. "This war has left us with nothing." While modern Yemen has always been poor, things have never been this bad for its citizens. Two-and-a-half years of war have unleashed what the UN is now officially calling the world's largest humanitarian crisis. Seven million Yemenis are considered severely food insecure. Three-quarters of Yemen's 27 million people depend on some form of humanitarian assistance, though one does not need statistics to know this. Everywhere I went, beggars lined the streets on a scale I had never witnessed in the country before. While driving in Hudaydah I was surprised that tens of beggars approached my window when I stopped at a junction. One of them was an old lady, who fixed me in the eyes through the glass. As I lowered my car window, she told me: "This is how desperate they have made us! My sons are now without salaries. Now I'm spending my last days in this world begging to feed them." With no public sector workers being paid for more than a year, her story is that of millions of Yemenis - from traffic wardens to teachers - reduced to begging to feed themselves and their children. A blockade imposed on Yemen since 2015 by the Saudi-led coalition has reduced the amount of food, aid and fuel allowed into the country to a trickle. The little that does make it in by sea often spends weeks waiting to be offloaded because the cranes at Hudaydah - once Yemen's busiest port - have been bombed beyond use or repair. When new cranes were donated by the US government to the UN's World Food Programme (WFP) last December, they were stopped at sea by the coalition and refused entry. While visiting Hudaydah, I met David Beasley, the WFP's Executive Director, who was conducting an inspection visit. "Food and aid should be weapons of peace and not used as weapons of war", he told me, adding ominously: "If these cranes do not make it in, hundreds of thousands of Yemeni children will die." In addition to reducing imports, the blockade has made the cost of distribution so high in Yemen that whatever food does make it onto the shelves is too expensive for the vast majority of people. Even aid agencies are struggling to fund deliveries, because so much must be spent on transportation rather than the supplies themselves. Despite the enormous scale and urgency of the crisis, the UN's aid appeal has reached only 39% of its $2.9bn (£2.3bn) target. 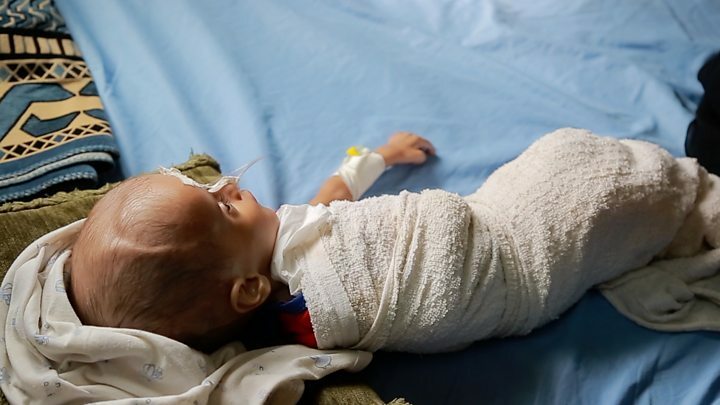 Meanwhile, Yemen's health ministry says the closure of the airport in the rebel-controlled capital, Sanaa, has led to some 10,000 deaths from treatable illnesses because people cannot travel to receive medical care. The coalition has said the blockade is in place to ensure that no weapons are smuggled into Yemen and denied that it is intentionally targeting civilians in the war. Wherever you go in Yemen, shortages of food and medical supplies are on an unimaginable scale. And yet, because of the political realities of the conflict, the country simply does not have the capacity to deal with the humanitarian catastrophe. Of course, this is not to say that the Houthis and their allies are blameless in Yemen's tragedy. They too have been accused by human rights groups of killing civilians and violating the laws of war - charges they have denied. The rebels are also alleged to have impeded the distribution of aid on the ground. I do not know what happened to Samira and Orjowan, as well as Abdullah and Hind and the rest of the people in their village. The tragedy of cholera is that it is both easily treatable, yet fatal within hours if left untreated. What is most heart-breaking about Yemen's humanitarian catastrophe is that it is completely and needlessly man-made. All the suffering we witnessed was completely preventable and could be stopped within days if the political will - by the warring factions and their supporters abroad - was there to do so. In the meantime, as international diplomacy continues to fail Yemenis, their lives will - unimaginably - only get worse.